Western Red Alder has a higher frequency of 6 and 4 pored grains that other alders. This is one of the 4-pored grains. 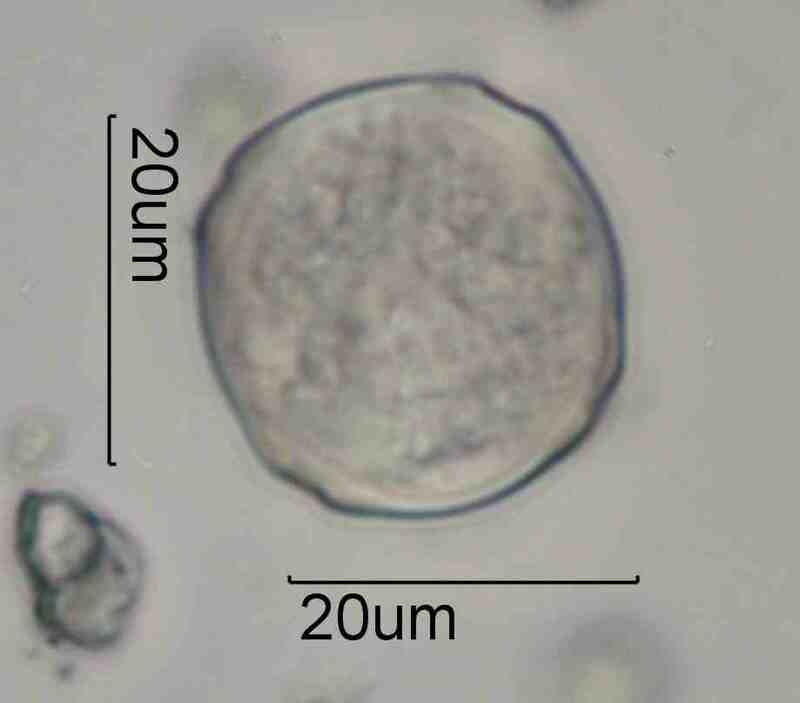 The granularity seen in this grain is evidence that this is a fresh pollen full of starch. The swollen condition of this grain makes the distinctive pore structure a little more difficult to see. In the Pacific Northwest Alder pollen may appear as early as January and may persist into April. It is one of the most prolific pollen producers and will mark indoor environments with a date stamp. The fresh pollen is loaded with starch grains, which carry the allergen. The grain will be present long after the starch grains have disappeared but the allergen may still be present but now spread out onto adjacent particles as well. Check your local pollen statistics to determine the most likely time for the deposition of this pollen at your site. Alnus rubra has about 70% 5-pored grains, about 20% 4-pored grains, and about 10% 6-pored grains. It is stephanoporate, all of the pores are in the equitorial plane of the grain. It is strongly oblate, is granulate (scabrate), and has characteristic arcs between the pores.